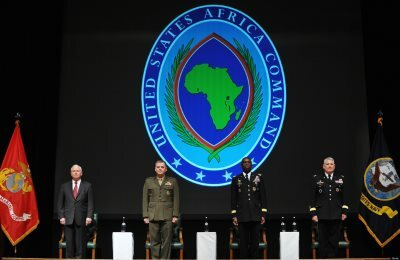 Home Editorial AFRICOM: Africa’s Help Or A Hindrance? AFRICANGLOBE – General David M. Rodriguez, who heads up the United States Africa Command, or AFRICOM, is the continent’s most powerful man. He is also its most powerless. Depending on whom you believe, Gen Rodriguez commands the full might of the greatest military in the history of the world: he could in one awesome shock-and-awe campaign flatten the continent into a parking lot for Humvees. Or, he is a benevolent hugger of children, with no violent mandate whatsoever. These are the extremes AFRICOM engenders. Is it here to hinder or to help? In the preface of their 1984 book The United States and Africa: A History, Peter Duignan and L.H. Gann concede that the literature on American foreign policy in Africa was considerable. At the dawn of President Ronald Reagan’s second term, if a policymaker were to look for a digestible overview of America’s involvement in Africa, there was but one choice, Messrs Duignan and Gann’s account. This illustrates that while US-Africa studies may be a robust academic field, it has rarely, if ever, translated into popular interest. This has had a trickle-down effect: ambitious young diplomats and State Department officials have steered clear of African posts if they hoped to advance their careers. This gap in historical knowledge and institutional memory has made it difficult for many American policymakers to understand the divisiveness of the relationship. Washington has, after all, spent billions on the continent over the decades, much of it with undeniably good intentions, almost all useless. As Messrs Duignan and Gann point out, the story starts badly, and goes downhill from there. Any account of Americans in Africa must begin with the slave trade. While there were slavers long before there were Americans, no modern society had created the need for so massive an indentured workforce before the tobacco and cotton plantations of the southern United States. Every well-intentioned action — the colonisation of Liberia in 1820 to “repatriate” freed African slaves — was nullified by an equally ill-intentioned action—the creation of Liberia in 1820 to purge America of unassimilable freemen. On the one hand, President Lyndon B. Johnson refused to back a UN peacekeeping force in Rhodesia when Ian Smith’s white supremacist Rhodesian Front unilaterally declared independence from Britain in 1965. On the other hand, President Jimmy Carter worked hard during the negotiations that ended the bush war in that country, thus helping to usher in liberation in 1980. This could go on for pages — the CIA’s involvement in the murder of Congolese liberation firebrand Patrice Lumumba in 1964; the Clinton administration’s inaction during the Rwanda genocide. But the cycle of cause and effect does nothing to describe the most important aspect of America’s relationship with Africa: no US administration has developed anything approaching even a rudimentary African foreign policy. President Barack Obama’s is no exception. It is this irreconcilable paradox — self-interest versus moral obligation — that has cancelled a coherent Africa policy, if not the desire for one. Aid was sent from mighty acronyms: USAID, the ubiquitous US Agency for International Development, as well as the Millennium Challenge Corporation (MCC). Both focus on “transformational development”, the evangelically-tinged buzz phrase that was meant to evoke an Africa transmogrified into a bastion of neo-liberalism. But USAID courted opprobrium by sending food from America instead of buying food from Africa; and the MCC, which was meant to appropriate $5-billion from Congress by 2006, was only granted $1.8-billion and never made its targets. George W. Bush’s baby, PEPFAR (the US President’s Emergency Plan for Aids Relief) unilaterally went forth into Africa to eliminate the scourge of Aids and treaded on the turf of the Global Fund to Fight Aids, Tuberculosis and Malaria, also operating due to the largesse of American lawmakers.